More than 40 years after it left the palace in Rajkot, the heritage Rolls-Royce, The Star of India, will soon return home. Haresh Pandya tracks down the road it travelled. It is not without reason that Mandhatasinhji Jadeja of Rajkot is known for four major passions -- heirlooms, heritage, history and the honour of the royal family. 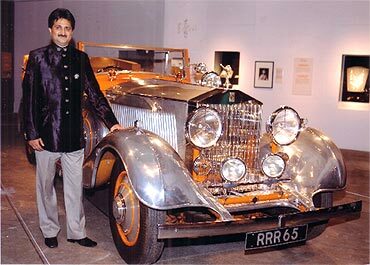 The scion of Rajkot royalty will soon have in his possession the heritage Rolls-Royce car custom built for his grandfather Dharmendrasinhji Lakhajiraj, the former ruler of Rajkot, in 1934. "I was determined to restore the ownership of The Star of India at any cost," a delighted Mandhatasinhji told Rediff.com in Rajkot. "It is not merely a luxury car or just a treasured heirloom. It is much more than that. It is an embodiment of art, culture and heritage. It is also a piece of history. Why, among the many dignitaries who graced and actually travelled in The Star of India were Mahatma Gandhi and the Queen of England." "My family and I are very happy and humbly proud that it will return to India and the Ranjit Vilas palace after 42 years in exile.". The family sold The Star of India to Bill Meredith-Owens, a British collector of vintage cars, in 1968. It was the star attraction at his museum at Stratford-upon-Avon, Warwickshire, and was issued the distinctive British registration RRR65. Once the costliest car in the world, it was last in possession of German collector Hans-Gunter Zach. 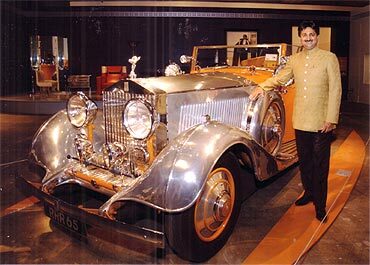 In 2009, Mandhatasinhji entered into a correspondence with the German when he discovered that the collector wanted to auction the Rolls-Royce along with his collection of 38 other vintage cars. He asked Zach to return The Star of India to its original owner, but the German told him to remain present during the auction to be conducted by R M Auctions Inc, Monte Carlo, on May 1, 2010. Since Mandhatasinhji was unable to travel owing to his schedule, he placed his bid for The Star of India on the telephone. Coincidentally, May 1 is also Gujarat Foundation Day. Mandhatasinhji -- whose father Thakoresaheb Manoharsinhji Jadeja has been a staunch Congressman and a former finance minister of Gujarat -- joined the Bharatiya Janata Party during the last Lok Sabha election. After participating in the golden jubilee celebrations of Gujarat organised by the Narendra Modi government, Mandhatasinhji zeroed in on the much-awaited auction in Monte Carlo on the Internet. "As my lot neared during the auction, I was excited, not nervous," he says. "When my turn came, R M Auctions Inc dialled my telephone number. The others were also bidding for The Star of India. But I had the last laugh with a bid of 575,000 euros (Rs 3.4 crore/Rs 34 million). The Star of India was ours!" "My family was watching the proceedings and we were all very thrilled. It was a very special moment for all of us. With the addition of the buyer's premium, the exact figure of the bidding was 644,000 euros (Rs 3.9 crore/Rs 39 million). The next highest bid was 555,000 euros (Rs 3.3 crore/Rs 33 million)." 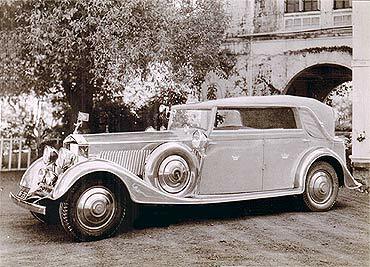 The Rolls-Royce Phantom II, custom built in 1934 for Mandhatasinhji's grandfather, Dharmendrasinhji Lakhajiraj, was more than just a luxury vehicle. It was painted saffron ochre, which the then maharaja thought was a symbol of purity and Hinduism. While the bonnet and wings were polished with aluminium, its interiors were made of ochre leather. The wood dashboard was in marble with saffron paste. The car had driving lights that could be steered and two small lights that flashed orange, signalling that the road should be cleared for the royal family. Searchlights on both sides of the car, with smaller lights attached to the windshield, were its other attractions. Splendid moons made of ivory and dark semi-precious stones with two small ivory elephant heads were placed at the back of the front seats. The Rajkot state crest featured prominently on the doors of the vehicle and side windows bearing the motto Ranje Dharmi Praja Raja (an impartial ruler of people of all faiths). The Star of India was mostly used at royal weddings and processions and when important visitors traveled to Rajkot. Dharmendrasinhji died in the 1940s while hunting Asiatic lions in the Gir forest. After his death the car was not used much, though it was one of the highlights of Manoharsinhji's marriage procession in 1954. According to R M Auctions Inc, Meredith-Owens had Wood and Pickett, which specialised in revamping luxury vehicles, carry out an overhaul in 1970. After the makeover he and his wife took the car on a lengthy tour through Sweden and Norway. 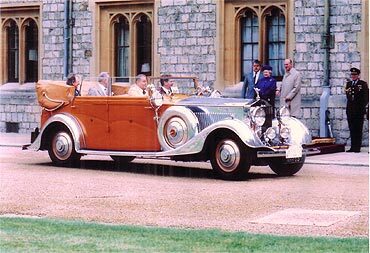 In 1977, it was a participant in the great Rolls-Royce parade at Windsor Castle to celebrate Queen Elizabeth II's silver jubilee. In 1989, after Meredith-Owens's death, his heirs sold the car collection. It was first bought by a German doctor and then by Zach in 2000. In 2001, The Star of India suffered an engine fire that affected parts of the front body area and its interior. Expert repairs were carried out, making the car ready for Techno Classica, the world's largest classic car show, in Essen in April 2002. The work conducted to the interior and the extraordinary leather cost over 70,000 euros (Rs 42.5 lakh/Rs 4.25 million). The car made a return trip to England later that month for Queen Elizabeth's Golden Jubilee. It was named the 'most beautiful vehicle' at the 2002 European Concours d'Elegance, an international car show at Schwetzingen, Germany and received a similar award at Tulln, Austria, in June 2004, according to R M Auctions Inc, which maintains offices in Canada, the US, the UK and Germany. In 2003, it featured on a special broadcast of ARD, the German public television service. At the event, Zach drove Johannes Heesters, the oldest working actor in the world, on stage to celebrate his 100th birthday. In all, the vehicle has made 24 television appearances in Germany alone, appeared in 200 press and magazine reports and shown at countless classic car events, including five Techno Classicas and numerous concours events, including Villa d'Este. The Star of India is currently the main attraction at the Art Gallery of Ontario's latest exhibit -- Maharaja: The Splendor of India's Royal Courts. Mandhatasinhji, his wife, two daughters and son recently visited the museum in Toronto's downtown Grange Park district. 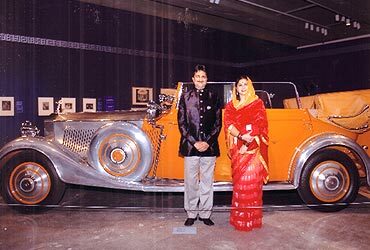 The car will return to the Ranjit Vilas palace in Rajkot when the exhibit closes in April. It will be showcased in the 'dream museum', which Mandhatasinhji has been planning to build in Rajkot to honour the state's heritage. "There are four vintage cars in the palace," says Mandhatasinhji. "There is also a silver chariot. There are a number of heirlooms in addition to 3,000-odd rare photographs of different royal figures. I am sure it will be a rich heritage museum." Mandhatasinhji gifted The Star of India to his father on his 75th birthday on November 29. "It will be a fitting, priceless gift from a son to his great father," he added. A budget Rolls Royce, at Rs 2.5 crore!